My card today is inspired by many things. First and foremost, it is inspired by my Dad, who celebrated his birthday last week. I won't get to see him for awhile, but we had a nice chat on the phone. 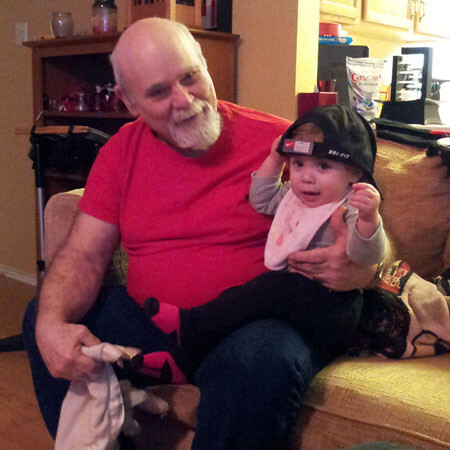 He is the guy, who after retirement, is taking on lots of household duties, and takes care of his adorable grand-daughter, Kamilla! He is busy all the time, and though we all appreciate and love him very much, we just don't say it often enough. Love you DAD and thank you! 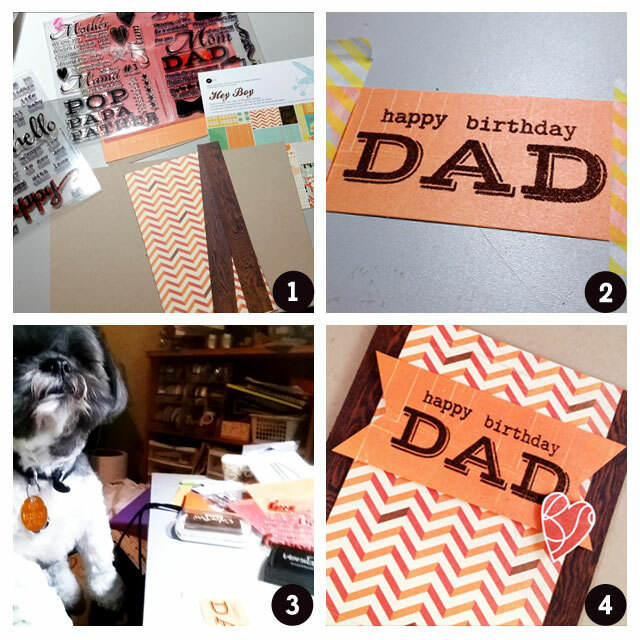 This card is also inspired by great paper from Basic Grey's Hey Boy paper pack, and all of the awesome DAD cards created recently by our September Leading Lady, Lyndal Higgins. If you haven't seen her amazing projects this month, check out the first and second installments. FAB-U-LOUS! I have a few shots of the process. Ready?....here we go! 1. I pulled out some of the Basic Grey papers and winnie & walter stamps including The Big, the Bold and the Happy, Parentville and Parentville Extras. My vision was to have the woodgrain strips on the sides and the chevron panel in the middle, letting the chevron pattern take most of the focus of this card. 2. Using a coordinating orange paper from the pack, I cut the banner shaped piece and stamped the sentiment with Versamark ink and embossed with Donna Salazar's Mix'd Media inx embossing powder in Truffle - love it! 3. Once the heat tool started up, Walter was bouncing up and down under the table, demanding to check my work. I'm telling you, he is a very involved member of the company! 4. I wanted a final touch on the front of the card, so I added the heart from Parentville Extras in Burnt Sienna chalk ink, and fussy cut it. The banner and the heart are both popped up with foam. I have to admit a little secret: I often do not add elements to the inside of a card. Gasp! I know, I know. But, I'm going to try to change my ways. :) I added a few strips from the paper, another Burnt Sienna heart and a sentiment of "We love you". And, finally - here is the finished card. Have a great day and a fantastic week! Oh my gorgeousness! Julie, I miss my dad so much... give him and extra hug from me? Love the DP - so happy I just got it on sale!!! Great card for a Dad! It conveys your message well! Lovely masculine card Julie! I really like your treatment on the inside of the card - great idea! 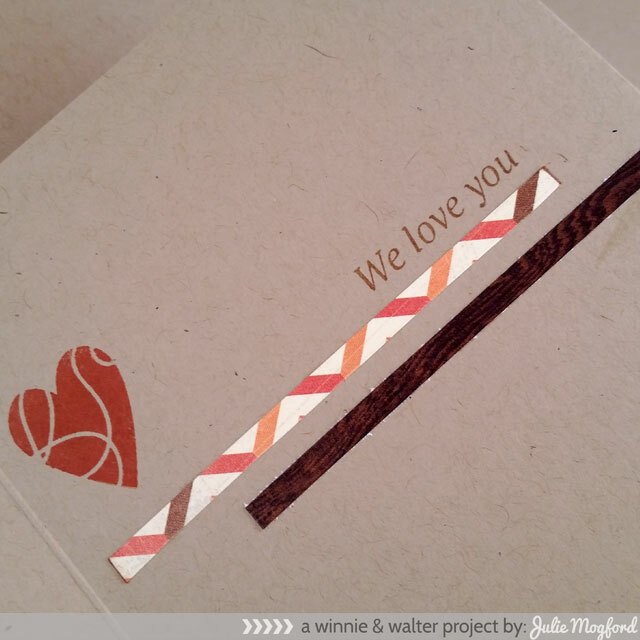 LOVE, LOVE the Winnie & Walter matched with the wood panels Julie - FAB card! Such an awesome masculine card! Belatet birthdaywishes to your Dad! Great card- I have often problems to make cards for men - thanks for inspiration! 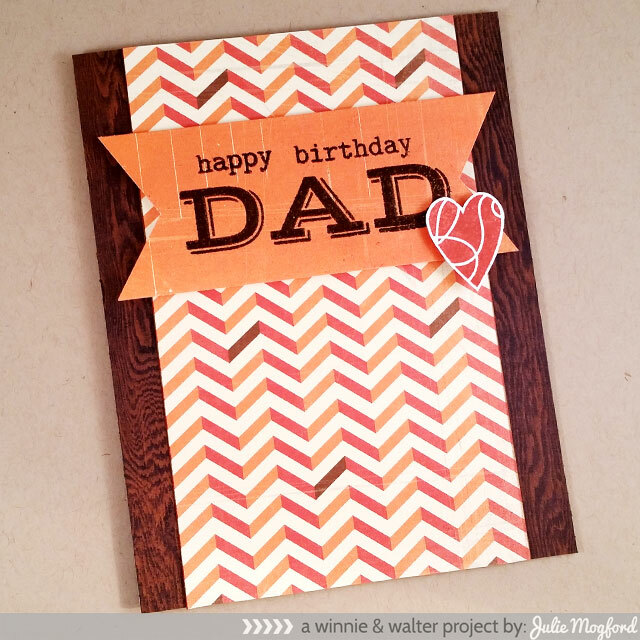 Happy birthday to your Dad...your card is so sweet. I love seeing pictures of grandparents with grandkids! Precious photo and lovely card Julie!!! LOVE your color combo, design and pretty sentiment stamps too!!! What a great dad card. It's always hard to figure out what they will like. Nice job.